After my recent travel over the ocean, I realized that there were a few things that I had forgotten–mainly the things I remembered last minute as I was rushing to make my plane. I decided that it might be fun to discuss this with other fellow travel and wine writers to create a set of strategies and few key lessons learned from many years of traveling. On our way to the Douro region from Oporto, Portugal, I sat with Panos Kakaviatos of Connections to Wine of France (via Greece) @PanosKakaviatos, Pieter Rosenthal of Cork and Bottle of Glasgow (via The Netherlands) @pieterrosenthal, and the lovely Lindsay Holas of Wine on Time @wine_on_time of London. Together we created the following recommendations that might benefit you this holiday season as you travel. Booking your flight online is probably the easiest way to save. Look into TripWatcher and get instant alerts when the prices drop. When booking your hotel, look into the online service Tingo which will automatically re-book at a lower price if the price drops. If you are looking for parking near the airport, one good option is to plan to spend the night in a Park, Sleep and Fly hotel which allows you to leave your car anywhere from 7-14 days for just staying one night. They shuttle you to and from the airport, all you need to pay is the one night stay. Reserve seats as soon as possible, preferably at the same time that you make your reservation. Order any special meals in advance. The good news is that you’ll almost always get served first. Tall? Reserve the last emergency exit seat for extra leg room. According to some experts, you might consider booking your seat more in the middle to back of the plane. Click here for a recent article to support these findings. Don’t choose seats that are too close to bathrooms, unless you plan to get up and go the bathroom often. Lines usually form around these seats. You will want to sleep if it is a long-haul trip. I personally prefer to reserve the window seat. But if you prefer to move around or if you have tight connections, reserve an aisle seat. If you are flying out of Europe, leave out of Frankfurt–there are free newspapers. Another idea is to consider going through Amsterdam, which has a great shopping mall as well, and has easy transport to and from the airport. Avoid Charles de Gaulle airport. This airport can be horribly complicated and confusing. When booking your hotel, look into the online service Tingo, which will automatically re-book at a lower price if the price drops. Find a hotel that is as central to the many sights you plan on visiting. Consider using AirBnB or booking.com. Also check on TripAdvisor online as you book, to get a better idea of what to expect. Check your passport and make sure it is still valid for the time there and back. Make sure that you have necessary visas, even for tours which cross country boundaries. Tours don’t always advise you of visa needs. Go to go to its embassy’s or consulate’s website, which may be found on the State Department Foreign Consulate website. Check your overseas medical insurance coverage before you go. Familiarize yourself with local conditions and laws. While in a foreign country, you are subject to its laws. The State Department website has useful safety and other information about the countries you will visit. Make sure you are up on all your necessary shots and vaccinations. Check out Travelers’ Health page of the Centers for Disease Control (CDC) website. 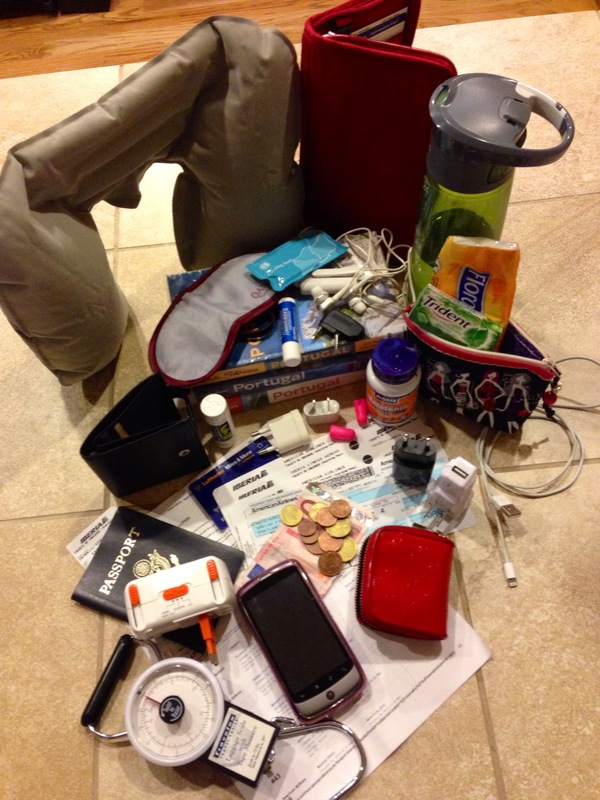 These are a few of my favorite things… What my carry on looks like. Save all your reservations on an online Travel management tool like TripIt or TripCase. The TripIt Pro offers the ability to re-book if needed and always keeps you up-to-date on your gate changes and delays. It is a great tool to use, I personally use it every time. My brother uses TripCase and it includes free travel alerts sent directly to your phone. Travel adapter idea: buy one adapter plus an extension cord with multiple plug inlets. This will allow you to charge multiple items at once. Buy a few combination locks that you can use on your suitcase and bags. If you leave your bag in your hotel room, this guarantees added security for your belongings and documents. Make sure to set the combination before you leave to something you’ll remember. Bring a small carryon that fits within another larger carryon. You can use this as your inflight go-to bag that easily stows under your seat but still leaves room for your feet. An example might be a purse or manpurse that fits within a small rolling carryon. You can fit your basic necessities in there and stow away the larger bag. Active? If you like to stay fit while you are away, consider taking your sneakers along with you and a pair of clothes that can be easily washed in the since and used again and again. I always ask at the front desk or the locals where they recommend going for a run or walk. The added bonus is that you are likely to see the city at different hours and in a different way. Your passport and a paper copy of your itinerary as well as the final address of where you are staying. Put a luggage tag inside each suitcase as well as outside, in case the outside one gets accidentally pulled off. Luggage tags should indicate your destination as well as your normal address. Be sure to add phone numbers, too. This precaution enables lost luggage to get back to you faster. Travel as light as possible. If you are planning on bringing a lot back, make sure one fits into the other so you can fly in with one, come back with two. Also realize that American carry-ons are larger than European ones. Going over is never the issue, but coming back you may run into issues. Make sure to check your European as well as American measurements and compare them to your handbags; check also with your airline carrier(s). You can avoid a lot of headaches by checking out these issues. Pack a Ziploc-type bag with your basic necessities that you might need on the flight as well as for your first days: toothpaste, deodorant, toothbrush, small tube of moisturizer, chapstick, basic meds. Remember the TSC guidelines. Passport and paper copy of itinerary, written down destination address. An extra charger for your phone, and don’t forget your laptop, tablet, and e-reader cables and chargers. A change of clothes with extra underwear and socks. Melatonin, allergy medicine like an antihistamine—IF allowed by your physician. Inflatable travel pillow, ear buds or noise cancelling headphones, sleeping mask, small amount of pain-killers and medications you will need for a week (in case your luggage is diverted), reusable water bottle, lotion, Pepto Bismol-type tablets and antidiarrhea tablets, sweater or scarf, and finally, tissues. Other carryon recommendations: Gum, eye drops, face wipes, and makeup powder if you need it. Carry an extra bag, just in case you’re overweight later. Bring along a portable luggage scale, you can use it to weigh your bags before you go and when you return to make sure you aren’t in for a surprise at the airport. You can pick one up at any of your local stores. Wear comfortable shoes and clothes. It’s not pretty but everyone bloats and swells, not to mention that airline food is often loaded with sodium. Bring in-flight entertainment, either a book or another form of entertainment. If you are like Panos, make sure you always carry a case for your glasses. Book a taxi/shuttle pick-up the night before you fly, or earlier, especially if it is an early morning pick-up. Wear dark and comfortable clothes, preferably layers. Dark clothes are best in case of spills. Pack a sandwich or snacks for long-haul flights in case you don’t like what they provide you inflight. Before you leave the house, make sure you program your timer on your heater to avoid frozen pipes. Don’t forget to take out the trash and clean out your refrigerator before you leave. Watch your preferred movie first and sleep the rest of the time; you’ll thank me once you get there. Set your watch to your destination’s time zone, this will allow you to adjust to better adjust to the time change. Walk around and stretch, drink plenty of water, this will help with the swelling and is good for you overall. If you like wine, most airlines offer a free alcoholic drink with the first meal. Drink it then, but stop yourself at one drink, since you will need to drink plenty of water to stay hydrated and wake up refreshed. Waiting for your bags to be unloaded? Why not go to the bathroom; this will save you the time and headache of trying to find a “free” bathroom later. Go to the tourist office in the airport, get a map, and ask about public transport or general cost of taxis into town. Public transport in Europe is usually quite easy and well worth the savings over a taxi. Save the money to enjoy a wonderful breakfast. Use the public transport, if you aren’t too tired or carrying too many bags. Decided on a taxi? Ask how much it’s likely to be, before you get in. That way they can’t jerk you around. Ask at least two drivers. For cities in Europe, consider buying a travel pass in the airport for public transportation. These passes often offer savings as well as eliminate hassle each time that you board a bus or train. Get a local SIM card with a data plan. The iPhone 5 by Verizon is automatically unlocked and can be used in other countries, and possible other iPhones and other smartphones. Check with your carrier before you go if you are unsure. Some airports have cellphone carriers in the airport. It is worth it to get the SIM card the minute you arrive, since you never know when you’ll get stranded and need to call the hotel for directions. Checking in: If they ask, business or leisure, say business; they’re likely to upgrade or give you a better room. If you are a journalist, let the hotel know you’re a journalist; you’ll get better attention. Don’t be naïve. Watch your bags, with your hands on your bags at all times. Hungry? Reviews are a great way to find the next place to eat. We like to use Yelp in the US, Foursquare and Trip Advisor in Europe. Avoid eating spots on the main streets or at places near main attractions; ask the locals where they go eat. You’ll get the best meals at the best prices. It may sound funny, but eat the local yogurt and honey; these are full of local probiotics which will help you adjust to the foods in your new area. Ask locals—and also check online–whether you can drink the water if you are outside the US and Europe. Generally speaking, eat what the locals eat. However, in some Third World countries, find out before you go which foods might not be safe. Now… go grab a bottle of wine and a local sandwich, sit in a park, people-watch, and enjoy it! We hope these prove useful to you. I always wished I had remembered half of these things when I was traveling. Safe travels and happy holidays! This entry was posted in Portuguese Experiences, Travel and tagged Best way to travel, Europe, global, how to plan for travel overseas, travel, travel list, travel tips, what to pack. Bookmark the permalink. Great comprehensive list! This is a good check list for both new and veteran travelers.